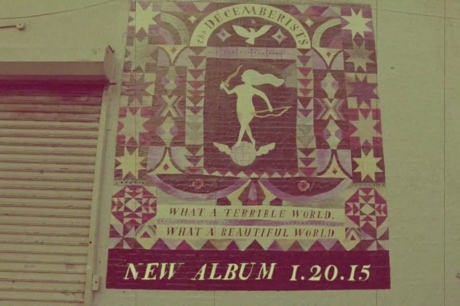 We already knew that the Decemberists had an album called What a Terrible World, What a Beautiful World coming out on January 20. Now, they've shared a trailer for the upcoming full-length. The clip lasts just one minute, and in that time, we see the band performing a mellow tune in the studio. This is intercut with footage of someone painting the mural in Brooklyn which Colin Meloy recently busked in front of. The album will arrive through Capitol Records. Watch the trailer below.